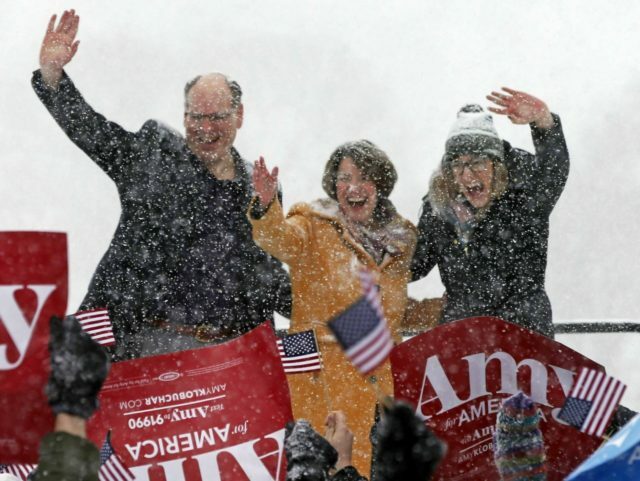 President Donald Trump took to Twitter Sunday to mock a Democratic presidential rival, Sen. Amy Klobuchar (D-MN), who supports radical action on climate change and launched her 2020 campaign during a major snowstorm. Klobuchar’s campaign website also cites climate change as one of her motivations for seeking the White House. She is one of the eleven co-sponsors of the “Green New Deal,” a plan released by Rep. Alexandria Ocasio-Cortez (D-NY) last week that proposes to move the U.S. entirely to solar and wind power within ten years. Minnesota is heavily dependent on coal, natural gas, and nuclear power for energy. It ranks eighth in the U.S. in wind energy production, but that only provides for a small fraction of the state’s needs. The state has also enjoyed major economic benefits from the oil boom in nearby North Dakota. Minneapolis reached a high of 19º F on Sunday, with 6 to 12 inches of snow accumulation expected.